Roman sandals, also known as Romanesque gladiator shoes, are ladies sandals. It originated in Rome. In terms of color, in order to echo the quaint flavor of the gladiator spirit, the earth color, dusk tones such as coffee, raw leather, and other original colors are the mainstream colors of Roman gladiator shoes; at the same time, decorated with luxurious suede and semi-precious stones, Or metal heels, rivets and buckles, and other hardware accessories, even more, exudes a sense of presence that can not be ignored. In the summer of 2009, Roman-style retro style sandals swept the entire T-stage, and a pair of flat-bottomed, Romanesque gladiator shoes with patented straps and delicate straps were the king of the popular. Gladiator sandals are the style of women’s shoes that are very popular this season. Especially in the spring and summer, because of the rising temperature, consumers tend to buy sandals that can make their feet breathable. They are dressed like the medieval gladiator of the Middle Ages. 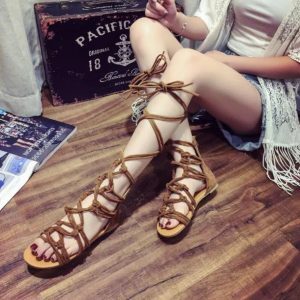 Wearing cross-strap sandals, in addition to catching up with the popular trains, is also very practical in the summer, and this season, the designers generally use the rough flavor of the gladiator shoes themselves and then blend the barefoot area. The tying rope is decorated with a sash, and when you put it on, you can show a modern and unique temperament with the color matching nail polish, so that the seasons of the ladies and the spring and summer of the past are always Compared with the situation where the lady’s style is unique, it is very innovative and more eager to try! Interestingly, this season’s ultra-thick bottoms in high-heeled shoes, as well as the ultra-thin bottoms that are commonly used for flat-legged and ballet, are found in parallel with the incomparable Roman warrior shoes. In addition to the traditional tether-wrapped style mentioned above, the upper also has the most popular pinch sandals, herringbone styles, or the design of ballet shoes that wrap around the ankles and even extend all the way to the calves. Changing into a more colorful look, people can see the infinite possibilities of the fashion stage, which is an eye-opener. Gladiator sandals have been on the verge of spring and summer since 2008, and they have shined in this season. In the summer of 2009, almost all major brands launched Roman elements, regardless of style, color or material, which gave the visitors a big surprise. But although gladiator sandals are everywhere, you need some skill to wear it. 1. Winding straps, T-shaped, chain-locking weaving, etc. are all categories of gladiator sandals. 2. Rivet decoration, fringe decoration, and rhinestone decoration are the popular trend elements of this season’s gladiator sandals. 3. From the material point of view, the leather texture and the snake effect are the most widely used, and the fluff and elastic band material can also be used as the key selection elements. 4. From the perspective of easy-to-match, black and white are the first choices for the color of gladiator shoes, while brown, dark green, orange and yellow are more suitable for people with fair skin; gray and milky white is more suitable for girls with wheat-colored skin. 1. Gladiator sandals have a strong tough temperament, so it is the best partner with pants, and it will have a good effect with narrow pants, denim shorts, and big pants. 2. From the dress, the tight-fitting lap, the floral skirt, the A-shaped skirt and the high-heeled gladiator with rhinestone decoration and tassel decoration are the easiest to match. 3. And want to create a sweet, candy-colored vest with a high-waist pencil skirt, choose light-colored gladiator sandals, using complementary color socks to wear the method can be easily achieved. 4. High-cylinder gladiator sandals and long-sleeved A-line skirts can easily create a national style, but the legs are not slender and not tall enough. 5. Want to create a cool girl, choose black rivets to decorate gladiator sandals and simple wind vest, imitation leather pencil pants and exaggerated accessories with metal decoration can be achieved.